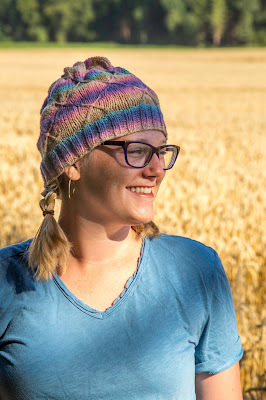 The story behind this hat is simple: I've been hanging onto this yarn for what feels like FOREVER now and I finally pulled it out of the drawer the other day and the light just flicked on - I knew exactly what it wanted to be. 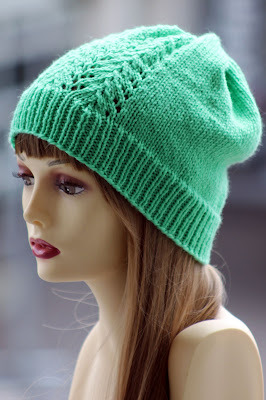 And this fun-to-knit hat is not just quick to work up, either, but also unisex so you can make it for whomever you'd like! A look at the finish. Knit this ribbing row until piece measures roughly 2", transfer work to your size US 6 circular needle, and then we'll work some transition rows, as follows. Notice that you'll need the following notation to continue; you can also find videos for these techniques below. First off; yes, I realize that I totally shouldn't name any of my knitting patterns after a joke in the movie Super Troopers, but - hey meow, sometimes, once the name appears in your head, you just can't shake it. Anyway, in this particular case, it seemed reasonably fitting. The yarn itself has a bit of tortoise shell/bird feather thing going on, for one thing, and the long slipped stitches also create a curvy zigzag pattern that somehow reminds me of a cat's claw. 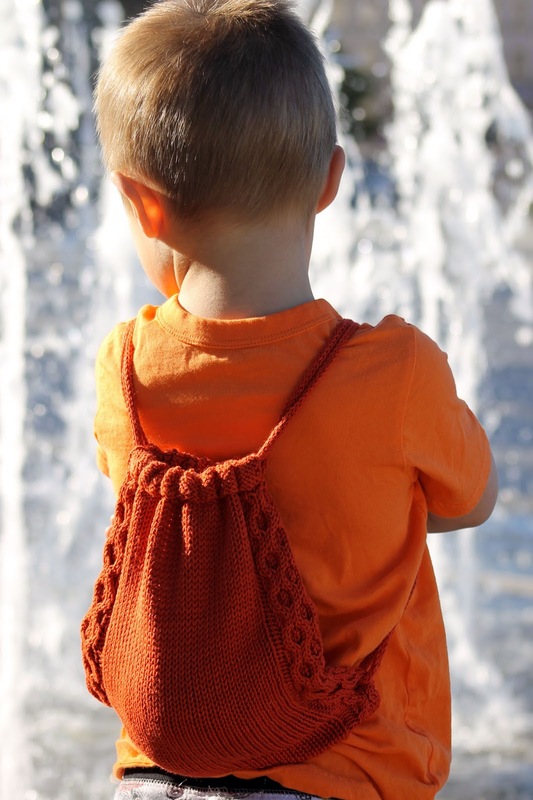 All of that aside, this is also a fun-to-knit, unisex pattern that's good for kids and grown-ups alike! 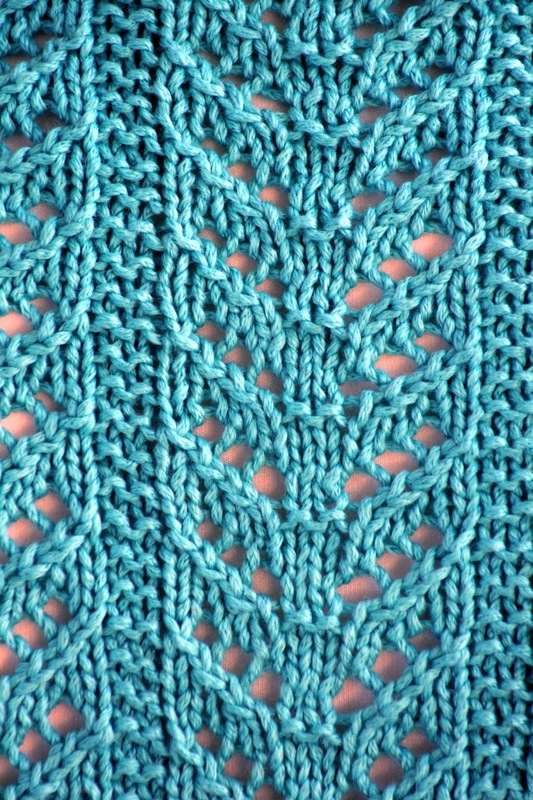 slipped stitch pattern. Zig-zaggy, no? Sometimes I buy yarns because they BEG me to bring them home, all puppy dog eyes and soft squishiness. 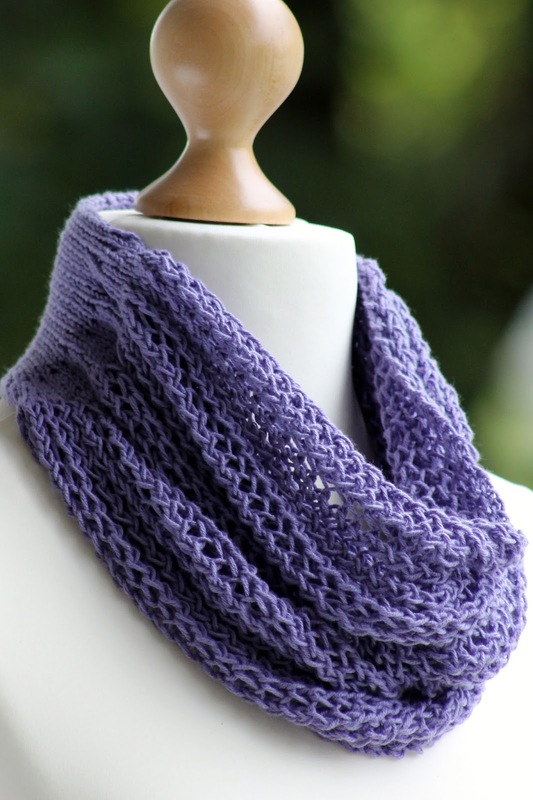 Sometimes I buy yarns because they're on great sale, and I'm my mother's daughter. And sometimes (like this time) I buy yarns because I happen to wander into a LYS in Lithuania and it's so small that I feel like I HAVE to buy something, but they stock almost exclusively Turkish and Italian yarns (so I can't find anything local) and nothing really catches my eye. Such was the case for me recently, until I finally spotted this nice alpaca. And then, of course, I used it for this fun design, which avoids any broken stripes by nestling the color change against a two-stitch stripe up the side rather than placing it at the beginning of the round. What can I say about this hat? Well, I guess I could start by mentioning that I still had a skein of this yarn left over after finishing the Rainbow Rib Mitts, and I thought that the variegation of it might work well for a larger project (since the color sections are on the long side, I thought I would at least get one full round in each color gradient for a hat). 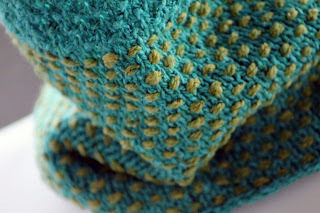 And since I also love the look of long slipped stitches with color work, I decided to combine the yarn and slipped stitch pattern for a fun, textured design. A better look at the finish. I keep looking at the hands in these photos and thinking, "dang how did my nails get so long?!?!" (since I'm always the hands in my photos). Then I keep remembering that today, for the first time ever (that's not exactly true - my husband has posed a few times), I AM NOT THE HANDS IN MY PHOTOS. 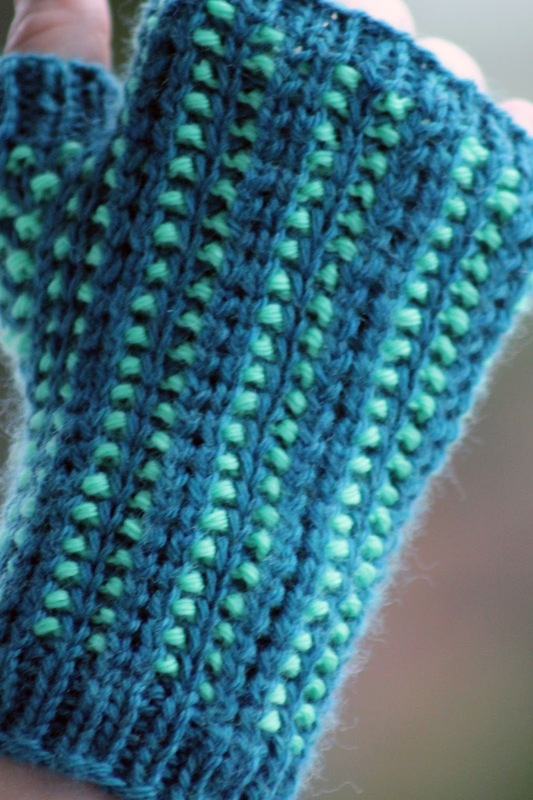 Not that my lovely hand model will probably ever agree to lend her digits to my knitting again, since I spent the whole shoot giving her instructions like, "Now happy fingers! No, happier!" and, "Angle your hands like you're standing up, but instead squat so your head doesn't cast a shadow on the mitts." Anyway, where was I? 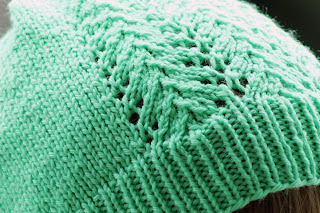 Oh yeah, I got this yarn ON SALE BABY, and it's a beautiful choice for this basic-but-not-boring pattern. 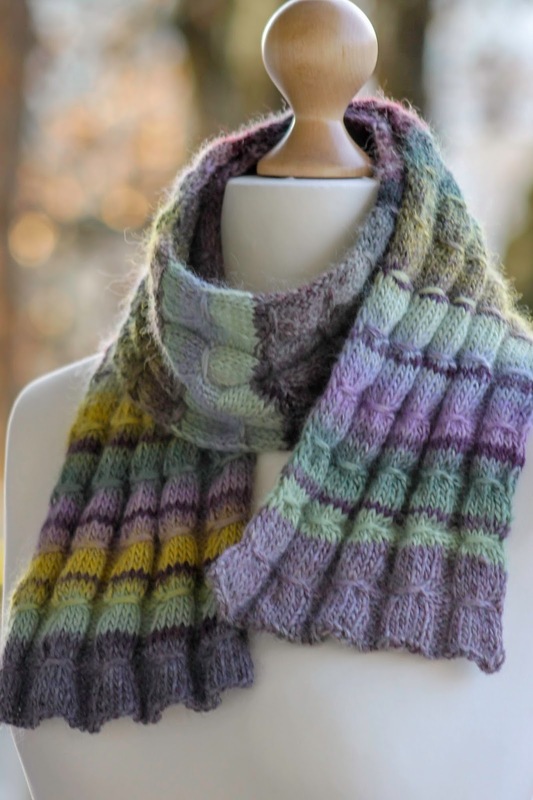 Oh, and word to the wise - if you use the same fiber, be forewarned that the pattern doesn't repeat in a linear fashion, but like a palindrome (so the colors don't go A B C D A B C D but more like A B C D D D C B A). 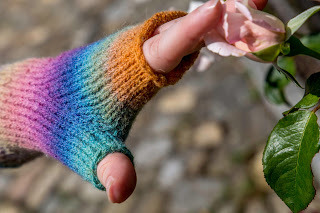 So, although I made my mitts match fairly well, I had to be fussy to get there, and it's possible that if you're equally fussy about matching you may need more than one skein to complete the pattern. times at my hardworking hand model. Those of you who follow my Instagram may realize that I attended the Edinburgh Yarn Festival last month (not that I posted much - one photo, maybe?). What you may NOT realize is that I also bought a crapload of yarn. 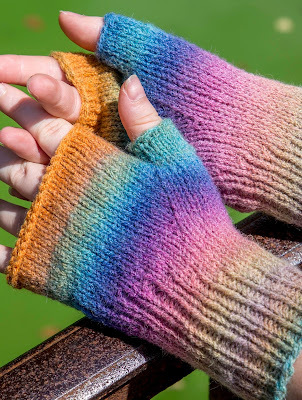 Of course, because my mother raised me to value a sweet deal, I bought both brand-new-perfect-condition stuff and quite a few "odds and ends," like the beautiful naturally-dyed fibers from the Skye Shilasdair Shop that I used for this design. Naturally, then, the Skye Shawl is designed for just such a collection of funny bits and leftovers, in case you have a few odds and ends of your own laying around the house. :) I ALSO bought a kitchen scale so that I could accurately measure my yardage; as you can see, I've bolded all of the colors and yardages below so that you can get a good idea of how many yards of each color you need to make this shawl for yourself (I've also already added a 10% cushion on the amounts I used, in case you're wondering). Oh, and I almost forgot! 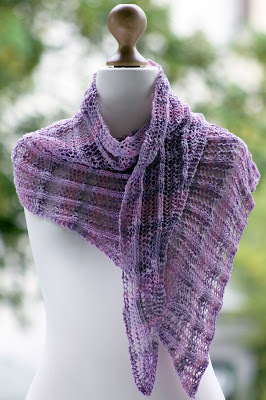 I also made technique videos for this piece, which demonstrate all of the important stuff you need to make this shawl. And yes, I know I start EVERY SINGLE ONE by saying "okay." Okay? Okay! Apparently I can't help myself. A closer looks at the stripes and the edgings. So let's make a shawl then! 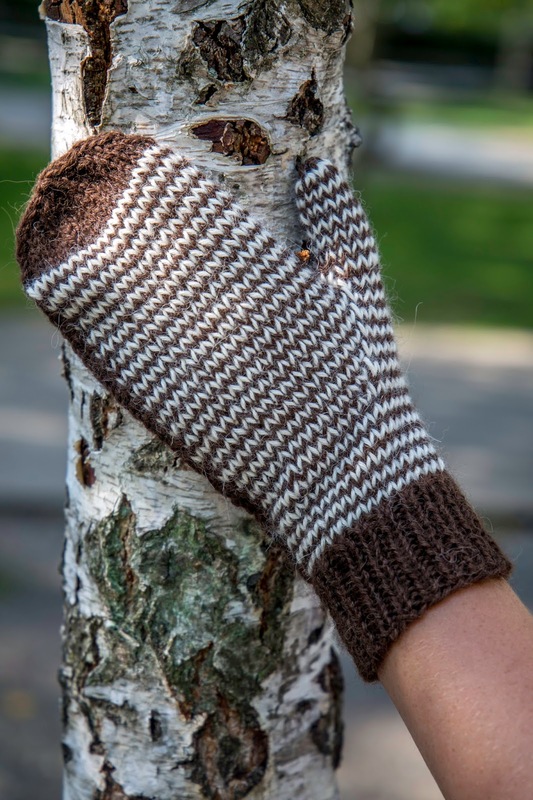 And remember - as I mentioned above, I filmed a series of technique videos for this pattern, so (hopefully!) you will be able to find a technique video just below any of the instructions with which you may need help. 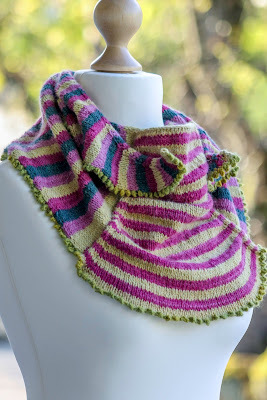 And with that in mind, in order to get this particular blend of stripes, we're going to begin by making the i-cord on the top middle part of the shawl, and then work the striped middle panel down from there. 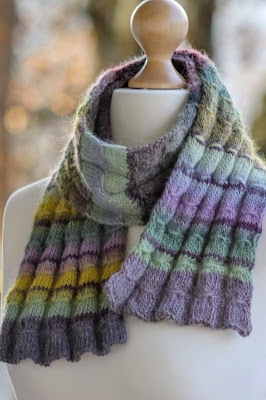 So, first, using one of your size US 5 dpns or your size US 6 or 7 needle and your color A yarn, cast on 4 stitches provisionally, making sure the scrap yarn you use to hold your provisional stitches is roughly 3' long. 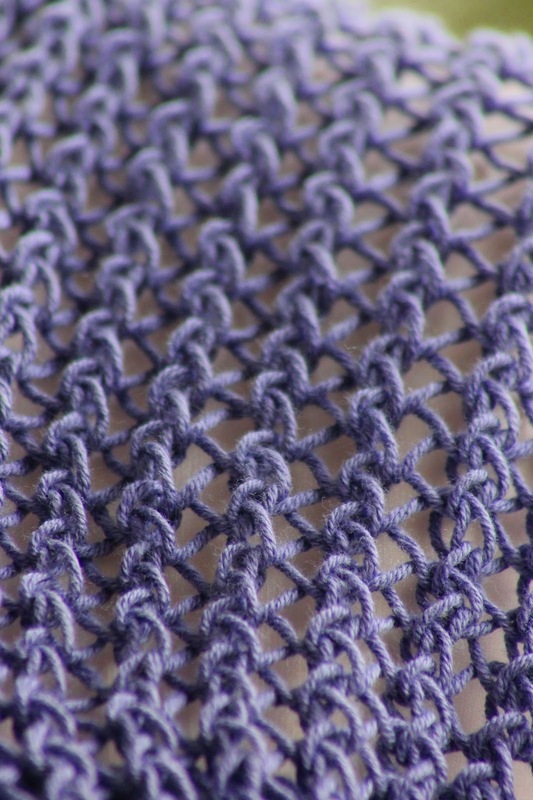 If you used a larger needle for your provisional cast on, transfer stitches to one of your size 5 dpns now. And if you need some help with these instructions, then the video below is for you (side note: when I watched it back I realized that I could have explained myself better. 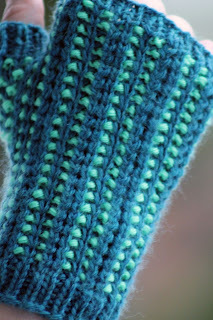 What I mean by "making space" is that if you're not going to size up your needle for your cast on, you should NOT pull the stitches around the scrap yarn tight, but instead leave them a little loose, as demonstrated). The story behind this hat is simple: I have a friend who struggles to find a hat big enough for her hair, and I happen to know an independent knitwear accessory designer who loves to make people stuff they can't seem to find in stores (hint: it's me!). So, basically, the Arrowhead Hat is designed with plenty of slouch and two different sizes to accommodate as much or as little hair as you'd like to put inside of it. Okay, I wish I had a good story behind this scarf, but I don't. Basically, I've just been on kind of a variegated yarn kick lately, in part because I find it super difficult to find good patterns for but I love buying it, so... you do the math! Someone's gotta come up with some stuff, right? Anyway, I designed this particular scarf to be on the shorter side, since I only had 2 skeins of yarn. 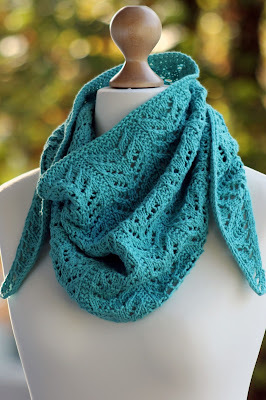 However, it would look very nice if you have a bit more yardage to work with, also, or even in a solid color yarn! On most occasions, I try to keep my knitting fairly seasonal (or representative of the months to come). 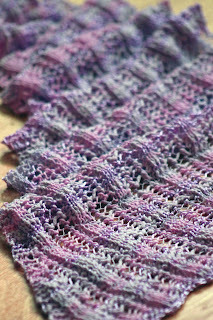 I'm sure that's why I bought this yarn and started this shawlette months ago, only to get hung up by my uncooperative forearms. Now that I've finally finished the piece, though, we should all just pretend it's summer again, and that the cold breeze I felt this afternoon was actually as balmy as July's winds. 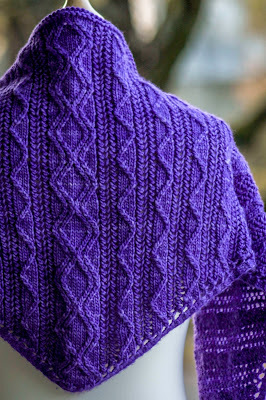 Or not, in which case you can file this pattern away for next year, when you've got 300+ yards of a cotton-, silk-, linen-, or bamboo-based fiber and a hankering for a short shawl (or even a big one, if you want to keep working and you've got enough yarn!). A better look at the pattern. Basically, just lace and garter stitch! hole thingamabob. I know, I'm a poet. 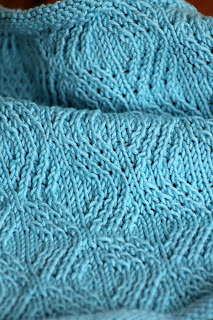 Knit rows 1 & 2 five times and then knit row 1 once more (all sizes). Then, clip yarn tail and transfer work to your size US 5 circular needle to resume later. 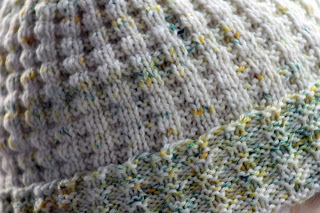 Again, using your size US 4 needles, cast on 36 (48; 60; 72) stitches loosely and work rows 1 & 2 five times and row 1 once more, although this time, when you finish, don't clip the tail. 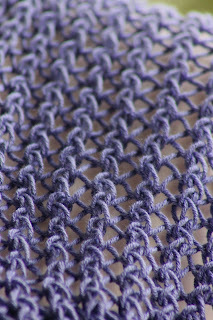 Transfer the work you've just finished to your size 5 needle, next to your other piece, making sure that the right sides (purl sides) are both oriented correctly, and that the piece you've just finished, with the running yarn connected, is lined up on the right-hand needle of your circulars so that you can continue work in the round. 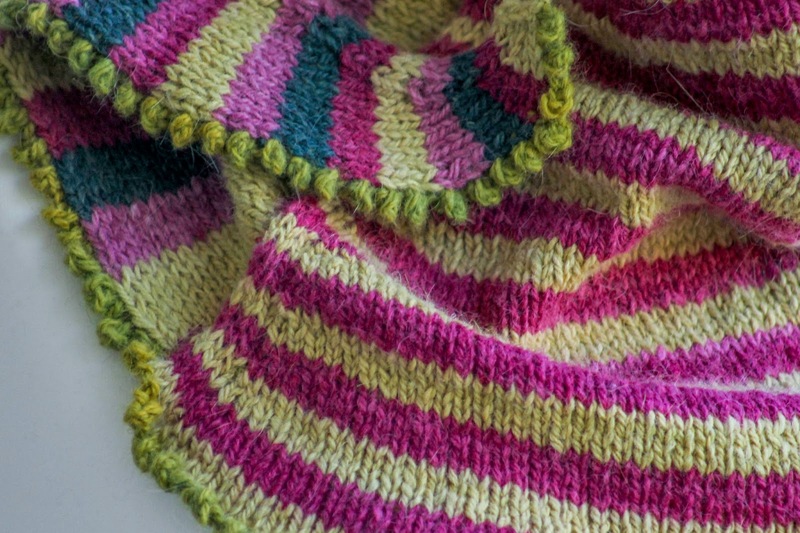 At that point, join in round, place row marker, and then knit one row around. Then we'll knit one transition/marker placement row, as follows. Since it's different for the different sizes, I have listed each size's row separately for ease. 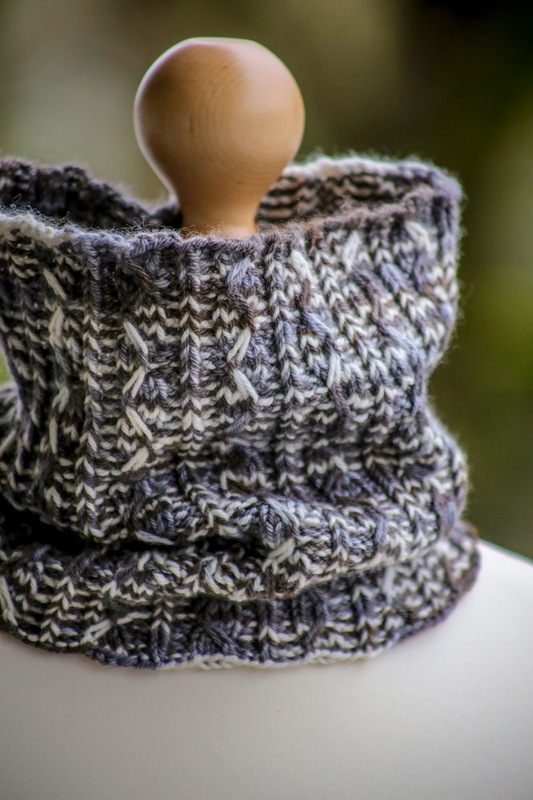 I would like to tell you something about this cowl, but the Pentatonix video blaring at 1,000 decibels to my right is distracting me slightly (what can I say, my children are obsessed!). So I'll just say, first of all, thank you to the dear friend who mailed me this yarn all the way from Alaska. 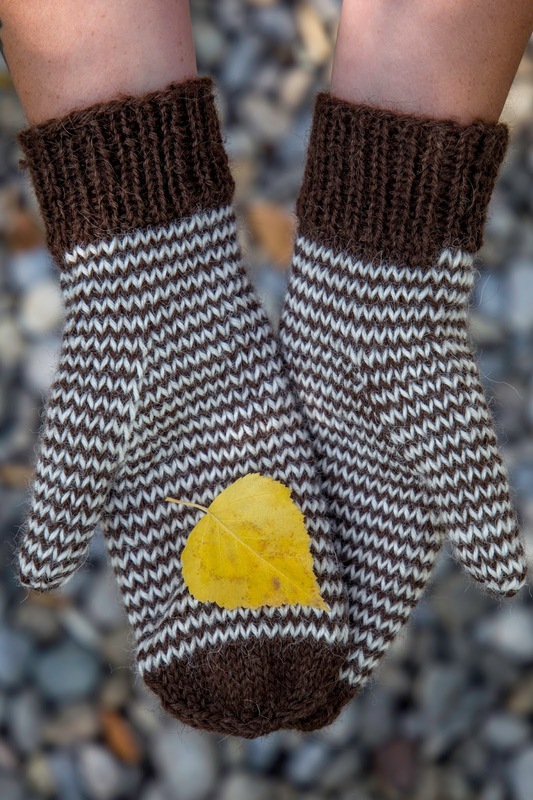 And then I'll get right to the pattern part, so you can make one of your own! 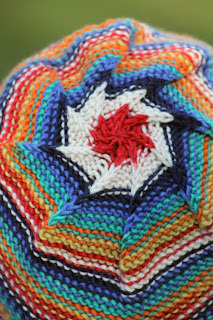 Another view of the pattern. 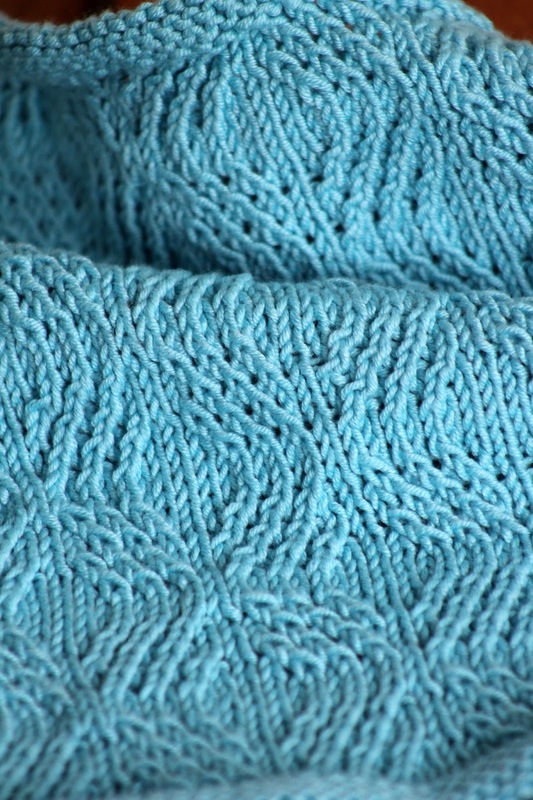 When I first bought this yarn, I definitely considered it a bit of a score; not only was it a fancy color gradient with size and texture fluctuations to boot, but it was also HALF OFF, price-wise. What can I say - I'm my mother's daughter, and can't pass up a good deal. But then, when I actually started trying to design a pattern for the stuff, it took everything I had not to give up and crawl into the bottom of a bottle. Why? 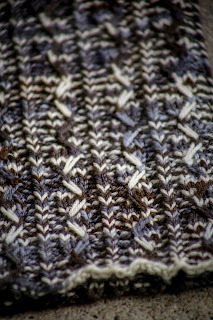 Because, my friends, fancy yarns like these do not take many (probably most) stitch patterns well, and I was also hell-bent on making something with some interest value that wasn't a cowl or a scarf. And while I'll spare you the full details of my tribulations, I will say that I think I came out victorious in the end. 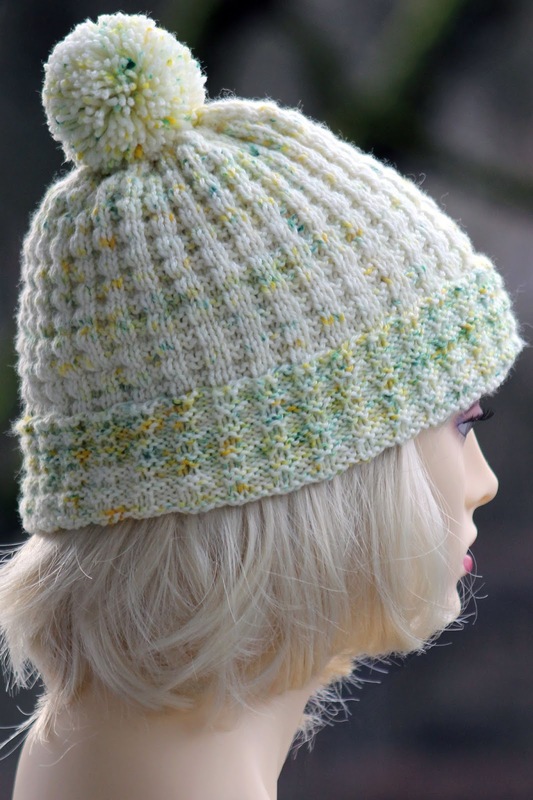 This pattern, after all, is well-suited to a fancy fiber, and also grows in a triangle shape so that you will still make something interesting and style-able even if you're not working with a huge amount of yarn. A closer look at the lace. 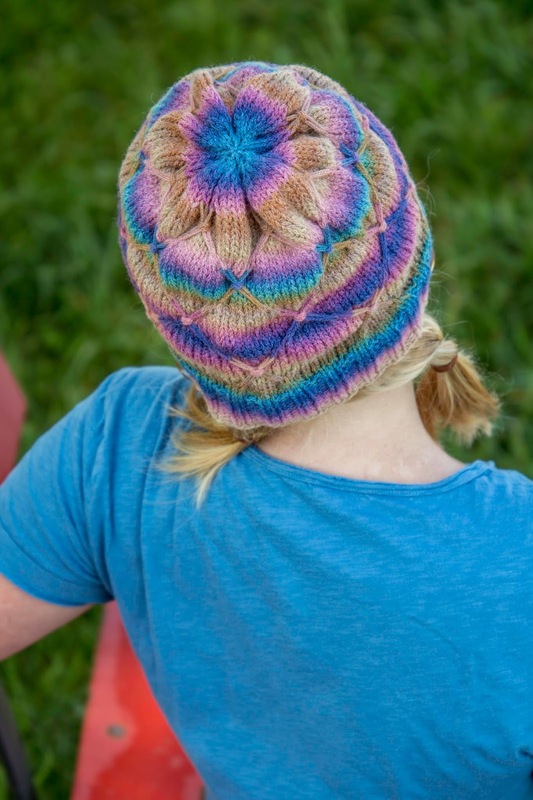 This hat was spawned with a variety of inspirations in mind; first and foremost, of course, I had to consider the yarn that my eldest son fell head-over-heels in love with at the store. And while I'm not usually a huge fan of a purled fabric, I do love the way it looks with a variegated fiber, which gave me the first clue about how to approach this hat. 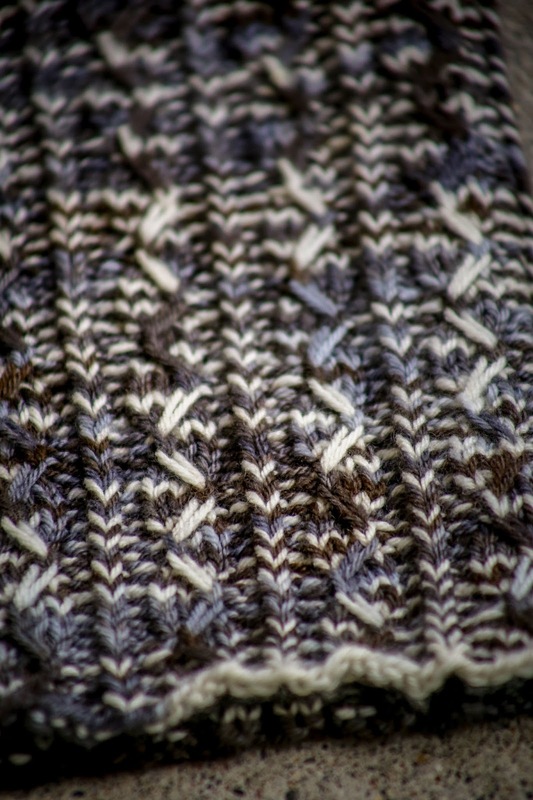 But since I didn't want it to be too basic, I also gave it the small detail of the knit stitches in the decrease to add that extra pop. 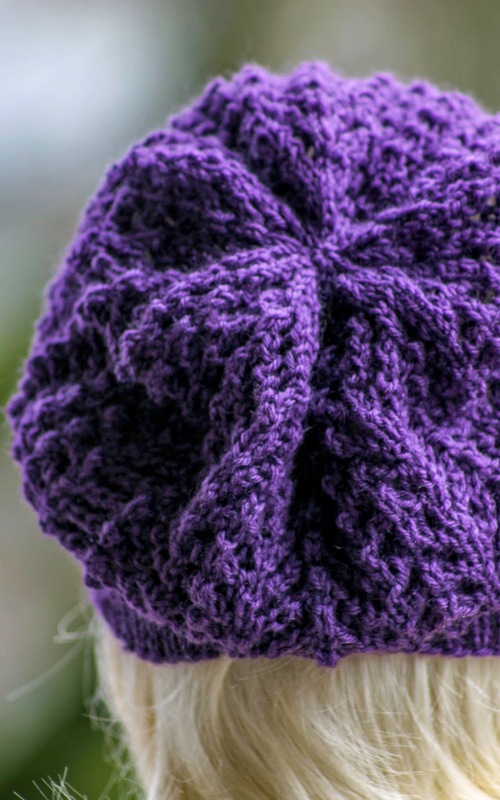 All in all, I hope you'll appreciate this hat's pinwheel finish and sleek look, and super-appreciate the fact that it's also knit inside out, so you don't actually have to work all those purls! So let's make a hat, then! As I mentioned above, this hat will be knit inside out, so that the bulk of the work will be knitting rather than purling. 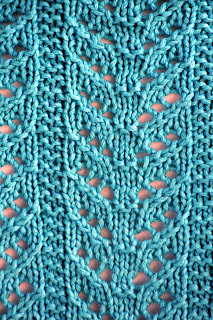 With that in mind, then, and using your size US 5 needle, cast on 96 (100; 104; 112; 120) stitches loosely, place marker, and join in round. 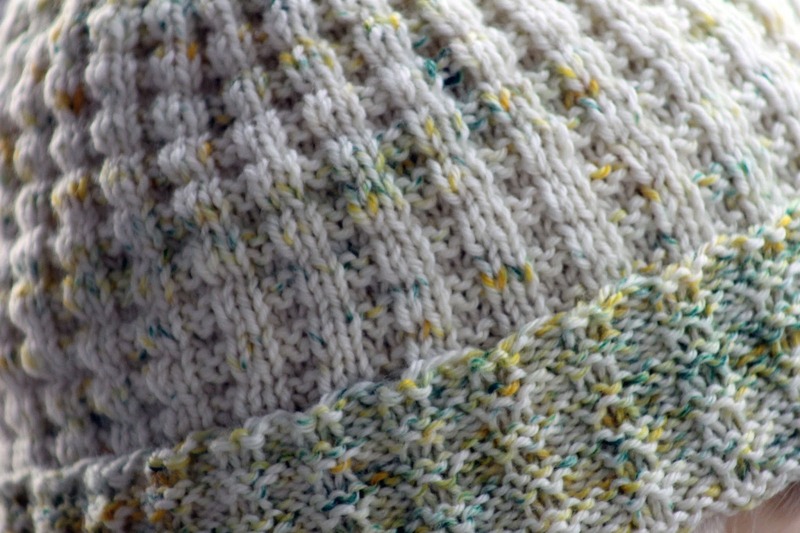 Then, purl roughly 1" (1"; 1.5"; 1.5"; 1.5") and transfer work to your size US 6 circular needle. 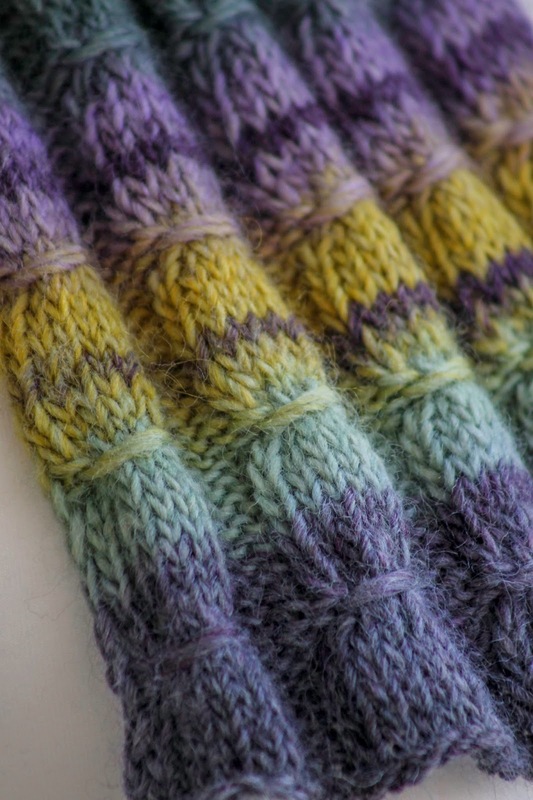 And now, knit until piece measures roughly 5" (5.5"; 6"; 6.5"; 7") from purled band. 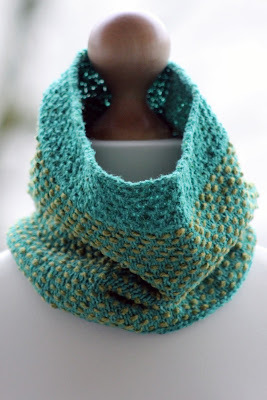 I got the idea for this cowl from the school pool across the street; although it's painted in a sort of ugly greenish-blueish hue, the lichen that grows along the top of the building elevates the color scheme somehow, and makes the combo quite pretty. I was even going to take a picture of the building from my balcony, for proof. Then I went out there with my big lens and couldn't help but feel like a degenerate for training my camera on the elementary swimming pool, especially since I could see classes going on inside, and I chickened out. So you're just going to have to take my word for it that this cowl is pool party-tastic, and wears the same colors as the building in which my kids will soon learn the crawl stroke. Okay, almost the same colors. There's no question that the green I chose is prettier! 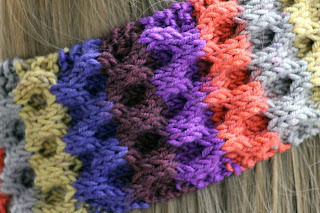 A closer view of the pattern. The story behind this pattern is simple: I got a request for another headband pattern and then basically fell in love with this yarn. 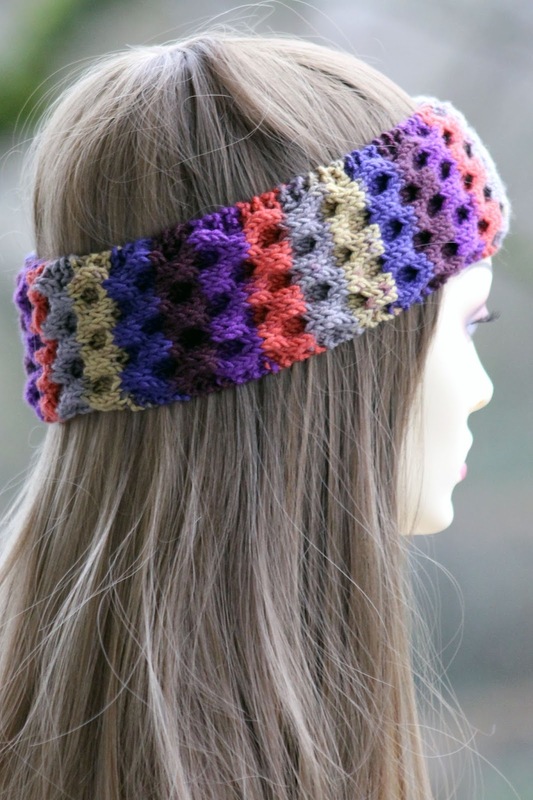 And while the headband has lots going for it - it's thick enough to keep your earsies warm! It's not too vertically stretchy! It looks cool! - I am especially pleased with the way it turned out in this particular fiber. 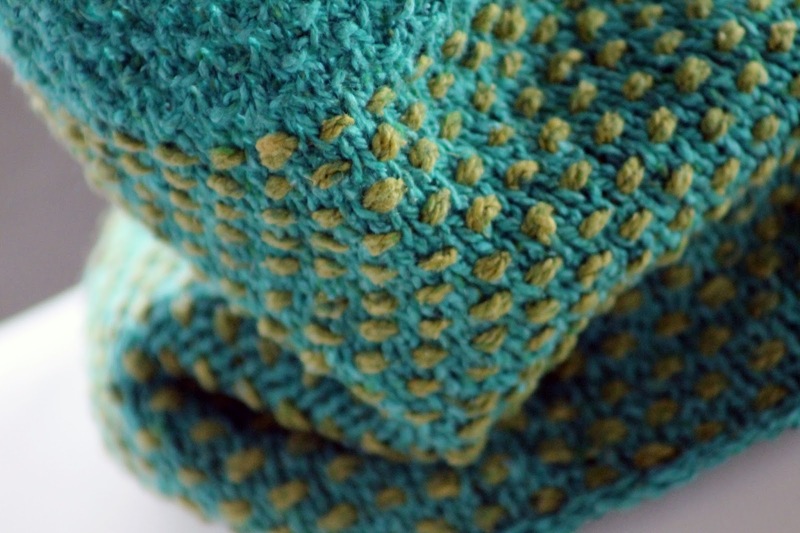 The variegation lines up perfectly with the stitch pattern for a very tidy result. So let's make a headband! 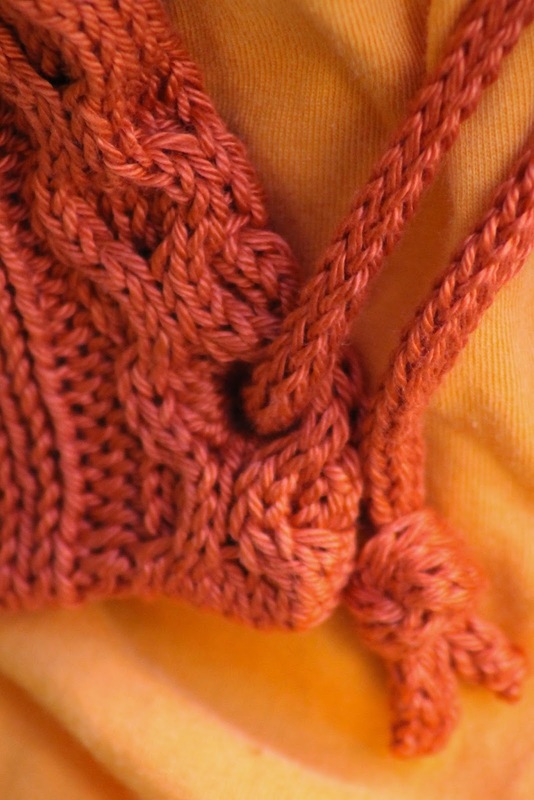 Using your larger needle, cast on 28 stitches provisionally. 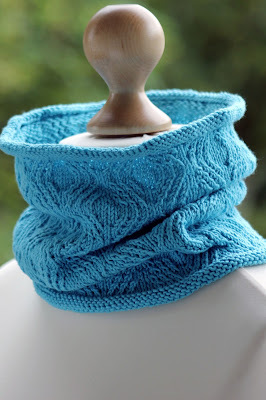 Transfer cast on to your size 6 needles. 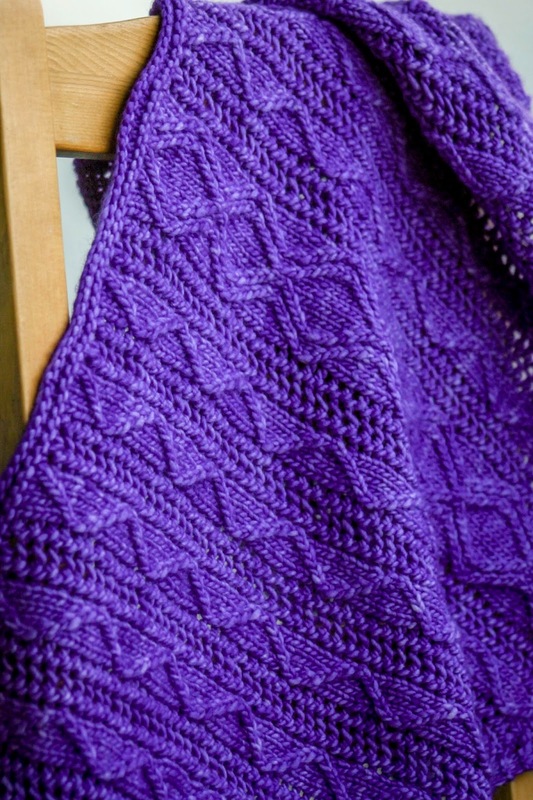 Then, we'll begin our main pattern, which is basically just Aran Honeycomb from page 273 of Barbara G. Walker's A Treasury of Knitting Patterns and some garter edging, for which we'll need the following notation. 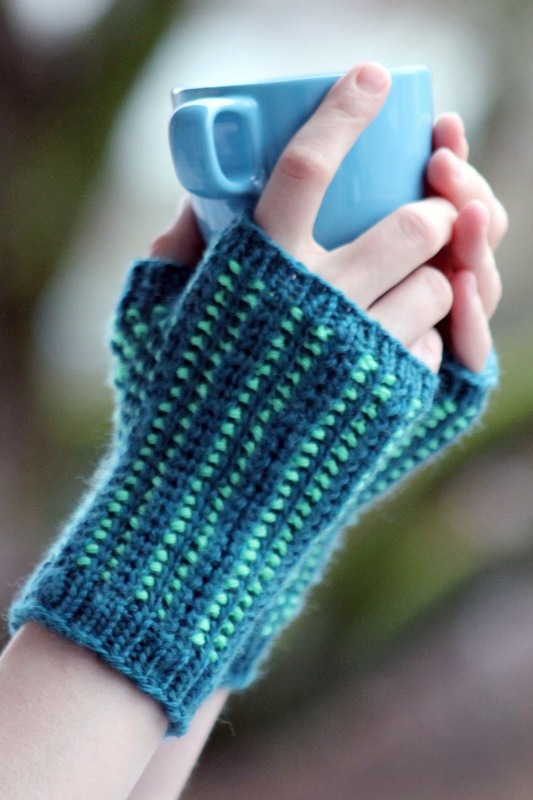 Oh, and this pattern is an excellent choice if you're ready to cable without a cable needle as well. Oh, and a big note on the sizing of these bad boys, too: I debated casting on an extra 5 stitches for each size (i.e. instructing to cast on 45 stitches for the smalls instead of 40), but ultimately decided that the sizing is correct as given because, at the very upper end of the size small, I love the snug hug of these mitts. 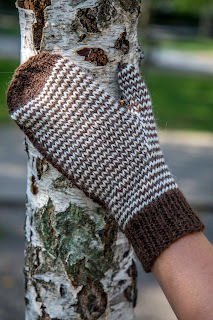 However, if you have any trouble keeping your yarn loose behind your slipped stitches or if you don't want a super snug-fitting mitt, I highly recommend that you knit one size larger than you might otherwise. Same goes if you're making these as a gift - don't make the small unless you've got specific hand dimensions or you're making them for a child, a bird, or a frenemy you want to feel guilty about the time you put into knitting mitts that she simply can't squeeze on. 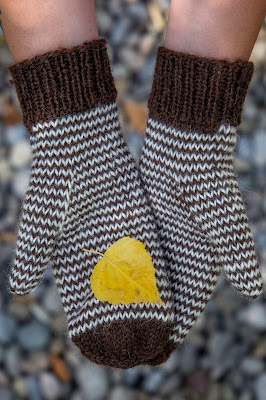 A closer look at the mitts. So here's the thing. 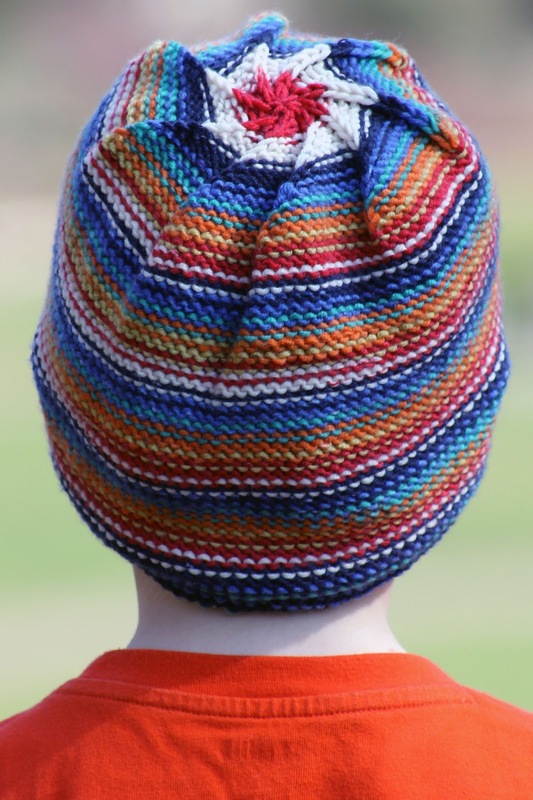 I had the inspiration for the texture of this hat very organically - proof lies in the picture below - when I was walking near my sons' new school. I was even more excited when I realized that I had actually brought a perfect yarn for the job with me from Wisconsin. So I cast on, got working, and then about halfway through realized that it's basically the same pattern I used in the Belt Welt Hat, except in miniature. Oops. 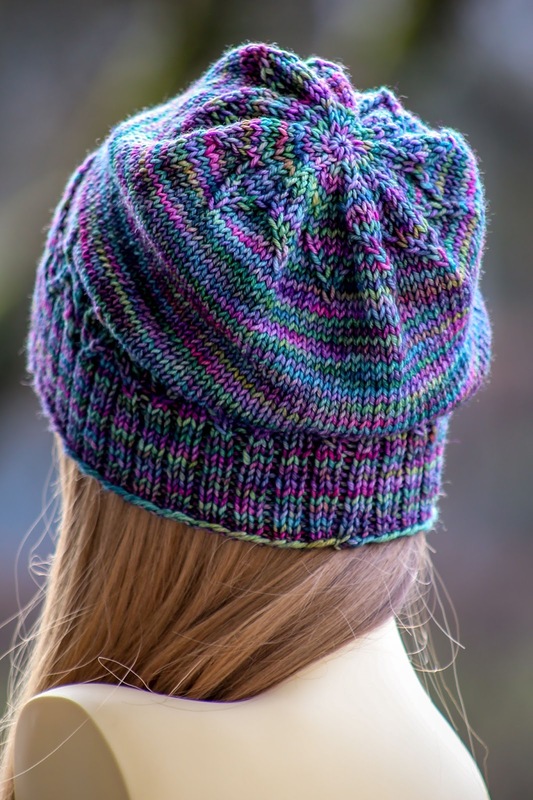 On the plus side, the Oops I Did It Again Beanie is a great study in how yarn weight affects texture, and is also a nice unisex design. So... that's something, right? it's pretty on the wrong side as well! So let's make a hat! Using your circular needles, then, cast on 128 stitches loosely, place marker, and join in round. Oh, and here's an inspirational picture for you in case you're already tired. See how pretty the texture is?